Ideally is to use a DK (any chunky) yarn and adequate hook. The sample button was made with a DK yarn and 3 mm hook. Chain 8 and join to make a ring. Round 4: sc in all st around. Round 5: Ch 2, sc in next st. Repeat to the end of round. Sl st to end. 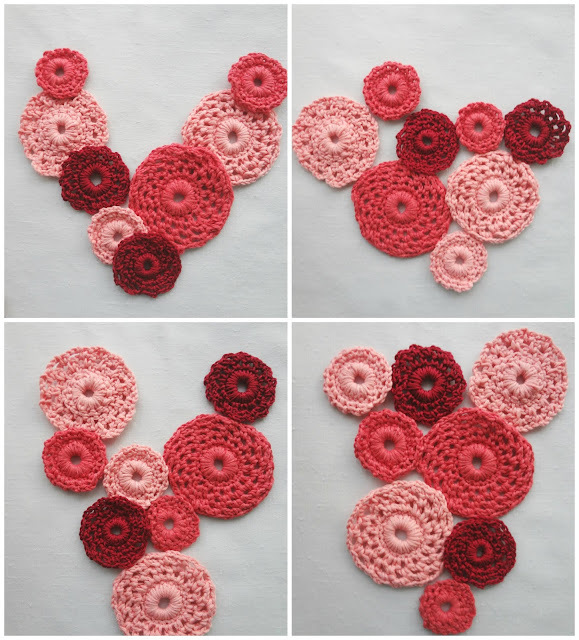 Tip: By changing the number of chains of the foundation, and by adding rounds, you can get a great variety of these crochet buttons. These can be used to make a unique necklace, a wonderful applique or decorations. I played with them here, arranging them to make a necklace. You know, I haven't tought of that Alhana.... Sounds interesting, but there have to be 2 or 3 necklaces together so that these stay put; otherwise they would just floppily hang. When I see these buttonhole doilies, I think of bracelets where the doilies could be layered on one another. They could become brooches as well. or simply used as appliques to create textures on a garment. Thank you for sharing this idea. 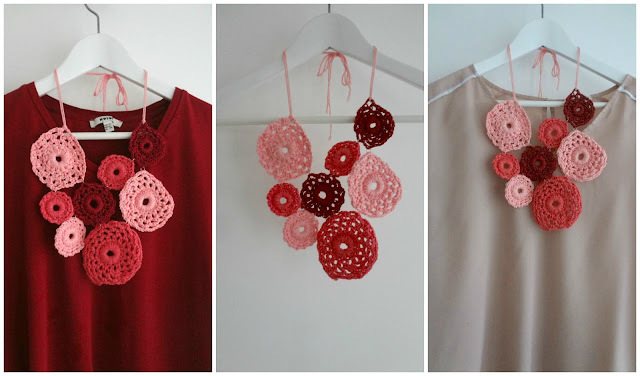 How perfect are your buttonhole doilies all sitting together to form a sweet necklace. I love the variations of colours. You and your imagination have done it again, Maya. As always, just fabulous! Thank you so much kim! I am still under the impression of an immensely simple project with such a lovvely outcome!